For anyone who has slept through the past month, I have a book out right now. (Redeeming the Rogue. Available at Walmart, Amazon, Barnes and Noble, etc., etc.) Remind me to schedule my books for release in the winter from now on. August, you see, is harvest season. No, I'm not a farmer, but I'm not far removed from my farming roots. I have a vegetable garden, fruit trees, and berry bushes. I frequent U-pick orchards for those things I don't have. And then I fill my pantry and freezer. 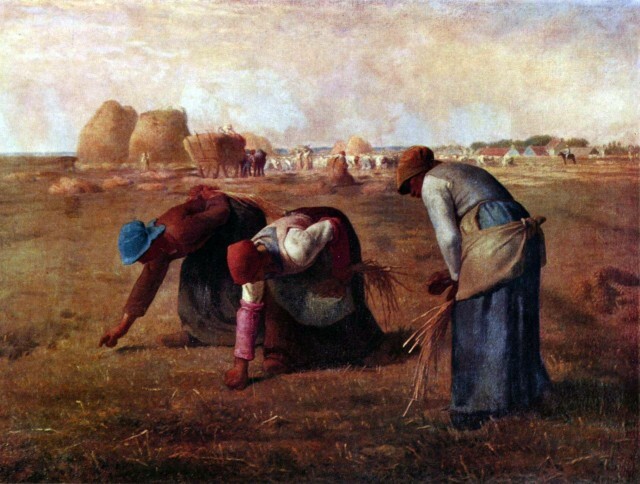 The ancient Israelites were an agrarian culture. Unlike their nomadic ancestor Abraham who lived in a tent and traveled from place to place, they built fortified cities. Their law contained specific provisions relating to the inheritance of land and reserving part of their harvest for God, the priests, and the poor. We see an example of both laws in practice in the world's first inspirational romance novel -- the book of Ruth. As I was attempting to juggle my hours among canning jam, chauffeuring kids, and writing a novel last week, my mind kept returning to Ruth. I love that story. I always try to imagine what must have been going through Boaz's mind that day he looked out at his grain field. He'd grown up in Bethlehem--spent his whole life there, most likely. It was a small town where everyone knew everyone else. There are no secrets in a small town. As the country song says, "Everybody dies famous in a small town." And then one day at the height of the harvest, Boaz noticed a woman he'd never seen before. She was young, poor, and diligent--a foreigner who left her people and religion behind. The more he learned about her, how she had left her own country to care for her mother-in-law, the more intrigued he became. Of course, he married her at the end of the book. (As I said, the world's first inspirational romance.) They had a son, who had a son, who had a son -- who became a king. I admit, the romance draws me back to that story over and over--not necessarily a good thing because it keeps my focus off the more important message of God's provision. God gave the Israelites specific instructions for taking care of the poor, both Jewish and foreign. The law forbid landowners from completely reaping a field, orchard, or vineyard. They weren't to harvest the edges of fields, beat olive boughs more than once in a season, or pick up what fell to the ground. Ruth followed behind the harvesters, gleaning what they left behind. It was hard, hot work that lasted from morning until evening and yielded meager results for the amount of labor expended. But God took care of Ruth. He rewarded her tenacity and compassion by providing her with far more than her daily bread. Isn't it interesting that God didn't instruct the people to just give the poor part of their crops? God provides for our needs, but He expects us to do our part. From the very beginning, even when all was good in the Garden of Eden, God expected Adam to care for the garden. In the last two weeks, we've been buffeted by a fresh round of dire economic news: a shaky stock market, the financial and societal chaos in Europe, predictions of another rise in unemployment over the next twelve months, ballooning debt. When the bad news seems overwhelming, we need to reconsider the Old Testament lessons. Work diligently. Take care of each other. And trust God to provide for our needs. Have you seen God's providence during difficult economic times? Can you suggest some ways God can use us to minister to others who are suffering economic hardship? This last year I have had to tighten the money belt so I have been very conscious when it comes to giving in church... watching every penny, which is not the way it should be. This has happened a few times now where I have opened my wallet to give say a $10 note that I know I have in my wallet but I can't find it. I then end up giving a $20 because I do want to give something to the Lord. And then of course, the next time I open up my wallet, there is that $10 note staring me in the face where it has been the whole time!! I feel like this is God's way of showing me that despite any money hardships, I can still give to the Lord because He will provide. Laura, we have a similar story from a couple years back. At the end of the year, we decided to make a donation to missions. The very next day, we received an anonymous gift in EXACTLY the same amount. Trusting in God truly is the ultimate way to survive chaos and crisis. Years ago, due to a horrible accident, we experienced times when we didn't know if we would have enough money to buy baby food and formula. God always made a way. And then we received an insurance check we were told we wouldn't get, that helped us get back on our feet. Truly, it was trusting God that got us through those times. Lovely post, CJ. I love the story of Ruth, too! Gets me every time. I love reading others' stories of God's provision. We have a few of those, ourselves; I wrote last year (or so) about how my husband and I came down with valley fever as newlyweds. We had nothing and were supposed to be working and saving for seminary. Then strangers paid our rent and our next door neighbors moved and gave us everything in their refrigerator. God's hand of blessing was all over us! It's so important to cling to what we know about God and remember what He's done. Thanks for your post! I remember when I quit my "security" job to take something less stressful so I could also write. My salary was half of what I had been making. I had no benefits. No retirement, no insurance, nothing. That was fourteen years ago. I haven't had a raise in seven years. I've sold some books, but probably made something like $0.50/hour off them. Yet, somehow, God has always provided for me. I've never done without, even when things got a little scary sometimes. He has always seen me through. God IS provider. It's an honor to be an example of that blessing in this economy. He will supply all our needs and I hope more people in this material-rich society start to see the truth of want versus need.